When life (or a local grocery store) sells you a loaf of stale french bread, make bread pudding. 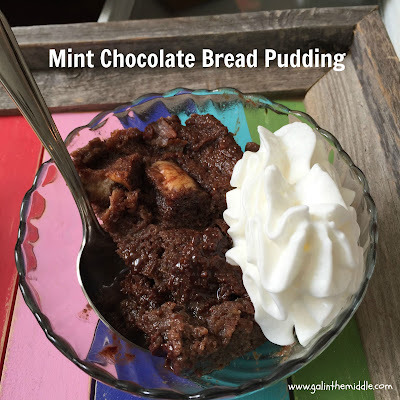 Or better yet, Mint Chocolate Bread Pudding! I'm a big believer that mint is not just a Christmas or Valentine's Day flavor. I love it ALL YEAR LONG. And the addition of mint chocolate chips to this recipe was a hit. I adapted my grandma's bread pudding recipe to make my version this weekend. 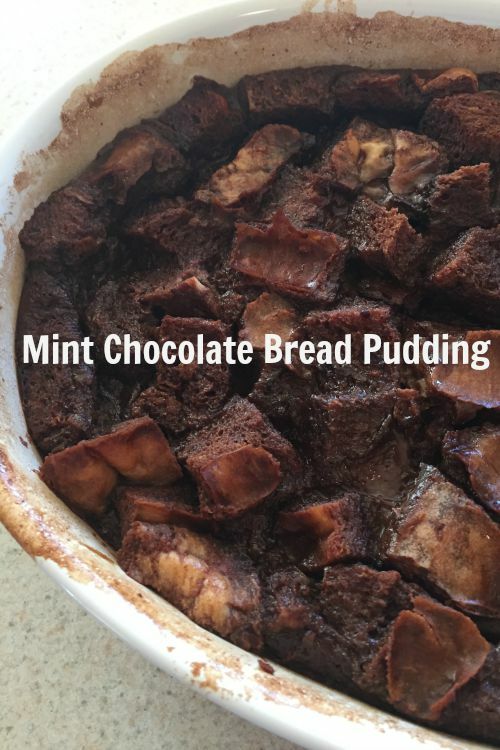 Mix the bread cubes and 1 cup of the chocolate, then place in the buttered baking dish. Over low heat, combine the remaning chocolate, sugar, cocoa and 1 1/2 cups of milk in a saucepan. Stirring constantly, cook until the chocolate melts and the mixture is smooth and slightly thickened. Pour into a large bowl (be careful, it can splash) and whisk in the remaining 1 1/2 cups of milk. Whisk in eggs, salt and vanilla and mix thoroughly. Pour over the bread and let sit for 30 minutes at room temperatures so the liquid can be absorbed by the bread. Bake for 45 to 50 minutes, until it's set (be sure to check the middle). Remove from oven and cool for 10 minutes to allow it to fully set before serving. It is really rich so just a heads up on serving size! Serve warm with whipped cream or ice cream. Be sure to scoop up the gooey chocolate on the bottom of the dish...it's worth it! P.S. We had a little bit left over and it was just as good warmed up the next day (and it wasn't too bad chilled straight from the fridge)!